In the eternal arms race between advertisers and viewers, the DVR is the viewers nuclear weapon. Finally we have a way to completely bypass commercials. It doesn’t matter how clever or interesting or infectious the ads are, we just hit fast forward and don’t have to deal with them; or at least that’s the way it was, until now. There is no equilibrium in any arms race, and advertisers, who were immediately looking for some way around the DVR loophole and back into the brains of viewers as soon as the digital recording technology came out, have been offered a clever new way to display ads by TiVo. ALVISO, Calif., Dec. 9/PRNewswire-FirstCall/ — TiVo Inc. (Nasdaq: TIVO), the creator of and a leader in television services and advertising solutions for digital video recorders (DVRs), today announced the launch of Pause Menu, the latest addition to its suite of interactive ad solutions designed to grab the attention of fast-forwarding viewers who consume TV differently and often do not watch ads the way they are traditionally delivered. 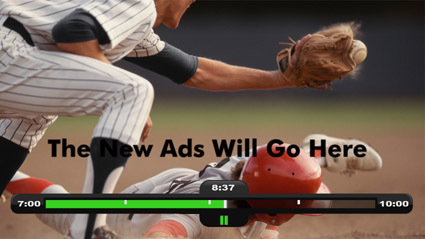 Using the TiVo Pause Menu, advertisers can, for the first time, reach audiences with targeted product messages displayed within the pause screen of a Live or Timeshifted program. The new feature can be particularly impactful for traditional TV and non-television advertisers that have product integration or a significant media investment in a specific TV show. Alternatively, they can opt to cast a wider net by targeting entire genres or keywords within a program description. The feature provides an original solution for advertisers seeking to capture the fast-forwarding viewer. It’s another example of how TiVo offers unique and different solutions for advertisers looking to get viewers to watch advertisements who avoid traditional spots. The new Pause Menu also provides broadband connected TiVo subscribers with a direct link to TiVo’s Swivel Search feature, allowing subscribers to easily find program information, related shows and downloads when they click on the “pause” button on the TiVo remote. Esteemed brands already have plans to launch Pause Menu campaigns. Mercedes-Benz USA, one of the first to sign on, plans to use the feature to help promote its new GLK SUV early next year by targeting football viewers. Twentieth Century Fox Home Entertainment is taking advantage of Pause Menu for their Dr Seuss’ Horton Hears a Who DVD and Blu-ray release on December 9. Promotions on the Pause Menu will be displayed as a single line of text and another line will link the viewer directly to TiVo’s Universal Swivel Search, allowing TiVo users to explore content without missing a second of their favorite show and creating a seamless, integrated experience. The new feature is available today to all TiVo(R) Series2 subscribers.